So I'm thinking about getting one of these new desks. It's a corner desk so hopefully it will give me more space. The grey shadows in the pictures represent my two monitors. Notice they don't fit very well. It would be much better of those two supports were on the outside of the desk instead of the middle. I'm going to have to trek down to the local Ikea to see it in person... with a measuring tape. There are some possible options. I could mount both monitors on VESA arms. They would attach to the vertical supports, wall-mount style. The problems with that plan are first that those arms are expensive. Plus I'd need an additional adapter to make my Apple Cinema display wall mountable. Looking forward, another big issue is that I eventually want to switch from a Mac Pro to an iMac, and iMacs do not have VESA mounts. 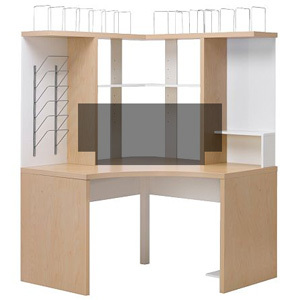 And finally... the desk is likely all particle board, so I don't know how strong those vertical supports would be, they might warp and eventually break under the weight of hanging monitors.